After much heated reactions as a result of Blatter’s comments about gays to abstain from sexual activites, Qatar was again in the line for some changes. 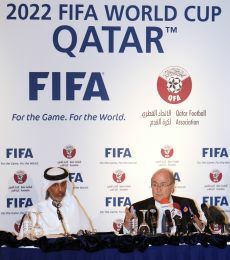 The world footballers’ union were of view that the 2022 Qatar World Cup to be switched to winters instead of summers. It is to be noted that the Gulf region is pretty hot in summers, which in result is not very feasible for players to play in such extreme conditions where the temperature sores upto 50C.Playing in such conditions would directly affect the players health and cause problems during the most important sporting activities of the world. EFA president Michel Platini, FIFA Executive Committee member Frank Beckenbauer and Asian Football Confederation general secretary Peter Velappan have also come out in support of a winter World Cup in the past week. FIFPro has said it is pleased Fifa is open to changing the tournament's timing to address the issue of heat. Fifa president Sepp Blatter has given his backing to the 2022 World Cup in Qatar being switched to winter because of the country's intensely hot summers. The secretary of FIFPro’s technical committee, Tijs Tummers, to award Qatar the tournament based on it still being held in the summer. "It is not sensible in a country with an average temperature of 41C in June and July, a midday temperature of 50C and, above all, extremely high humidity," Tummers said. Tummers insists though that switching the dates the weather concerns could be countered. Also the players might be in better condition than if the tournament was held in its traditional slot at the end of a grueling European season. “If you look at what happened last weekend with weather problems in Europe because of heavy snowfall, you could see this as an advantage rather than as a problem. In separate remarks, FIFA president Sepp Blatter and general secretary Jerome Valcke said moving the Qatar matches to winter deserves study. It could protect players from heat and show flexibility for future bid cities.